Wonderful news for those of us with early Dutch ancestors in New Netherland (present day New York)! 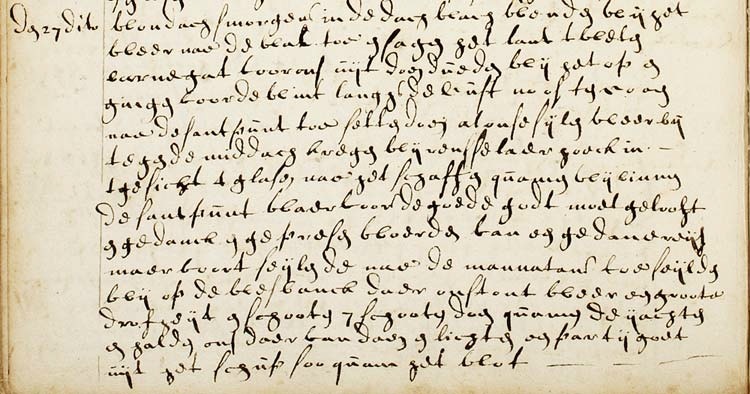 Thanks to Terry Vanderhoof, a translation and transcript of De Bever Journal of May-July 1661 is now on line at The Vanderhoof Project. I asked Terry to tell us how this project to transcribe the ship's journal began. Here is his answer. Please note that I have taken the liberty of adding links to online passenger lists for any ships Terry mentions, as well as other relevant links. I guess that finding the key to the story of the voyage at 35,000 feet over mid-Atlantic is pretty appropriate, as I've often looked down at the ocean and wondered if De Bever ever sailed in the waters we could see below us. I'd been reading Jaap Jacob's 2005 book "New Netherland: A Dutch Colony In Seventeenth-Century America" during the flight to New York and noticed an intriguing reference to the "Ship's Logs Gulden Bever, Gulden Otter, Hoop and Roseboom 1660-1663" This was puzzling for, in the years I'd been researching the Vanderhoof family, no mention of a log for the Bever voyage had ever been mentioned. The bibliography of Jaap Jacob's subsequent book "The Colony of New Netherland : A Dutch Settlement in Seventeenth-century America" (2009) gave more detail, giving as a source an article in De Halve Maen of January 1968 by Dr Kenneth Scott . Scott's article was based on a partial translation of an original document held by the New York Historical Society "Journael Behouden opt'schip den Gulden Bever en t'schip den Gulden Otter" but, for reasons of space, Dr Scott only included a summary of each voyage in the article and omitted much of the routine positional and weather details. * First Voyage : The Vergulde Otter 10 Oct 4 Dec 1660 New Amsterdam to Texel. * Third Voyage : The Hoop 8 Sept - 26 Oct 1662 New Amsterdam to Texel. 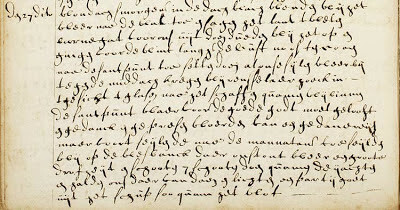 the Historische Kring West Betuwe, the archivists at the Regional Archief Rivierenland at Geldermalsen/Tiel and the staff of the Sheepvaartmuseum in Amsterdam, a transcription and translation of the account of the 1661 voyage of De Bever emerged. The handwriting was pretty readable for the period - most likely copied at a later date from rough notes kept at sea - and we managed to decode most of the technical seafaring terms with a good deal of help. As always, direct translations from Dutch to English aren't always possible and we hope we have reached a reasonable balance between readability and faithfulness to the original text. One major revelation was that De Bever hadn't taken the 'traditional' route via the Caribbean but had first headed for the north of Scotland, attempting to reach the Atlantic via the straits north of the Orkney Islands. This decision was probably made because of the uneasy state of relations between Portugal and the Netherlands at the time but almost ended in disaster as De Bever and her companion the St Jan Baptist were caught in a storm in the Moray Firth. As always, opening one door reveals a whole row of new doors to be opened and now that some details of the voyage are clearer, many further questions need to be asked. How was the voyage planned? How did the 37 folks from Beesd get to Amsterdam? How long did they stay there? What was the induction and boarding process? What was life on ship like? Hopefully, some of these questions will be answered in the near future. When I research my ancestors, I also research their siblings and spouses on every generation. I do this because a) it's interesting and b) you never know when a record for a sibling will reveal information you haven't found on your direct ancestor. Recently I was hunting for the obituary of a distant Peer relative and found a sad, yet intriguing notice about her in an Indiana newspaper of 1937. Mary A. Peer was born in Berrien Michigan in 1857 and married Robert Curran in Michigan in 1883. At some point after her husband's death in 1889, Mary and her son Elwood Curran moved to the area of South Bend Indiana. "Because she was too proud to ask for charity, Mrs. Mary A. Curran, 82 [sic], is dying of starvation in Epworth Hospital today. She was found in bed in her shabby little shack where she lived alone...."
The article goes on to say that a neighbour decided to check on her because he hadn't seen her in three days. "She had only a few potatoes and a sack of oatmeal in the home. She once applied for a state old-age pension but withdrew it on the protest she would have an income from her farm." What is even sadder is that according to the article, her only son Elwood was in another hospital at the time. I am sure he would have taken care of his mother had he been able to. Mary must have lingered in her weakened state, because according to my records she did not die until September 10th, some three weeks after this article was published. I could not find an obituary but do not have access to the South Bend Tribune where I understand there is one. Thanks to crowdsourcing on my Facebook page, I learned that the St. Joseph County Public Library has an online index to obituaries in the South Bend Tribune from 1913-present. Researchers can pay a small fee for lookups, so off I went and sure enough there were 3 entries for Mary A. Curran. I printed the request form, filled it out and will mail it today. I hope to learn more of Mary's sad story from the notices. Poor Mary, her husband died so soon after they were married, leaving her with a very young son. To die in such sad circumstances is indeed a cruel twist of fate. I will do almost anything to hear him talk. Dr. Jones makes genealogy fascinating, complex and yet understandable and doable. He is a great presenter and one person who really makes me think! Last October, Olive Tree Genealogy held a giveaway for a Flip-Pal Mobile Scanner and Carry Case. The winner was Shirley Farrar and Shirley was kind enough to send me photos of how and where she used her new Flip-Pal Mobile Scanner outside the home. Shirley tells me that she didn't go to the Ontario Archives as her first outing, instead she conducted some genealogy research at Toronto's First Post office. This post office was built in 1833. It is the sole surviving example of a British Colonial post office in Canada (the Canadian postal service was established in 1851) and the only museum in Canada that collects and studies pre-confederation British North-American postal history. According to the website, its library and archives are available to researchers by appointment. As a National Historic Site it tells the story of the Royal Mail in Upper Canada (present day Ontario). It looks like Shirley is enjoying her new Flip-Pal Mobile Scanner! List of Winners from the Blog Book Tour Giveaways. If you see your name please visit Denise's blog to contact her. 2. Go to the RootsTech 2013 website and tell me which session in the 3-day Conference you would most like to attend. I want to know the name of the session, the presenter and the day. 3. Send an email to otg.giveaway@gmail.com telling me WHERE you shared this blog post and the session (plus presenter and day) you want to see. "...has its roots in northern France. Today it is found most frequently within Viking / Scandinavian populations in Northwest Europe and extends at low frequencies into Central and Eastern Europe." It's been really interesting reading up on this and finding out more about our McGinnis paternal line ethnic origins, especially since my brother's Y-DNA showed a mutation that scientists know exactly where and when it occurred! Turns out it was around the time Hadrian's Wall was built between England and Scotland and his gene mutation is known to have come from a group of Basque at this time. My mtDNA results from FT arrived and I wrote about those at mtDNA Test Results Arrived! My Haplogroup is J2a1a1a2 but I still don't completely understand my full results. I'm hoping 23andMe will provide more interesting details. For those following my saga of ordering a marriage transcript from Michigan Vital Records, I received a response to my letter of complaint. To summarize events - Using the VitalChek service, I ordered a rather expensive ($70.25) 1876 marriage record for Barney and Maggie McGinnis from Michigan. It arrived but Julie Cahill Tarr found the original image online and pointed out several errors in the transcript, including the wrong witnesses. Caveat Emptor? Or Does Michigan have a Complaint Desk? I wrote to Michigan Vital Records and explained what had happened. I kept my email brief and ended it by asking what they were going to do to rectify the situation. "Unfortunately, our searchers made an error when completing your request. They actually have to photocopy the pages in a very large journal so that they have the information for our keyers when they transcribe the record. They make the photocopy and highlight the information; however, in this case, they highlighted the wrong line on the second page." Whoever wrote the email (there was no name included in the email) went on to say that they were redoing the transcript to show the correct information and would courier it to me at their expense. I understand why they would not offer a refund. The fact that the original image was online and I overlooked it is not their problem. I ordered a transcript (although I confess I thought I was ordering a copy of the actual image) and they were willing to correct their errors and send me the transcript I paid for. It was disappointing to learn that the items that were omitted on the transcript (Barney's occupation and the church where the marriage occurred) are not part of what you pay for! "Also, the name of the church where the marriage took place and Barney’s occupation are not issuable items on a transcribed marriage record." "I apologize for our error in processing your request. We always try to provide good customer service, but sometimes we don’t always do that. Please accept our sincere apologies, on behalf of the whole staff." What gave me a chuckle was the added notation that "...we are including a self-addressed stamped envelope with your corrected record and ask that you put the incorrect record in it and return it to our office so that we can dispose of it properly. " I had to laugh for two reasons - I think I can throw out a piece of paper either by crumbling it and tossing it in the garbage or shredding it in my shredder! Second chuckle was that I had a feeling that Michigan Vital Records didn't have loose Canadian postage lying around and the "stamped" envelope would arrive with an American stamp. Does everyone see where this is going? Sure enough the corrected transcript arrived yesterday and yep - one American stamp on the envelope for me to return the incorrect transcript. Problem is that last time I checked Canada was not (yet) part of the USA and an American stamp doesn't cut it with Canada Postal Services! In other words if I mail something from within Canada I have to use a Canadian stamp! It's mind-boggling to me that an official organization such as Michigan Vital Records doesn't realize that every country has its own postage and that the sender of snail mail must use postage from their own country. Since they were issuing me a new transcript they had my address and must have seen that I live in Ontario Canada. The following NEWS RELEASE was sent to Olive Tree Genealogy by Denise May Levenick of The Family Curator blog. Denise has written a book How to Archive Family Keepsakes and many bloggers are participating in a fun and informative Blog Book Tour from January 10 to 26th. The Virtual Book Tour brings new books and authors directly to the reader, and with the Blog Book Tour for Denise Levenick’s new book How to ArchiveFamily Keepsakes genealogists and family historians are browsing the pages of this new book via the internet during the16-day tour of popular blogs and websites January 10 – 26, 2013. Blog book tours are popular trends in the general e-publishing world but had limited exposure in the family history community until Gena Philibert-Ortega introduced her book From the Family Kitchen to genealogists in a virtualbook tour in August, 2012. Enthusiastic response to Levenick’s blog book tour shows that the virtual tour continues to be a welcome new event. After a successful launch January 10 at the author’s family history blog The Family Curator, the tour stopped at eight more websites. Each day, content and reviews gave readers a chance to sample Levenick’s new book and learn more about organizing and preserving family keepsakes and genealogy papers. Free handouts, book excerpts, exclusive articles, reviews, and author interviews are among the different kinds of content posted in the opening week. Participating blogs included: Geneabloggers; GenealogyGems Podcast Blog; Moultrie Creek Gazette;, 4Your Family Story; OliveTree Genealogy;, TheArmchair Genealogist; Shadesof the Departed; and Dr.Bill Tells Ancestor Stories. January 20-25 the Blog Book Tour continues with visits to six more genealogy blogs for new articles, interviews, and reviews -- Practical Archivist; TheIn-Depth Genealogist; Food. Family. Ephemera. ; DearMYRTLE; AnceStories; and The Houstory Hearth. Proceeds from the sale of How to Archive Family Keepsakes during the Book Tour will help fund the 2013 Student Genealogy Grant founded in 2010 to assist young genealogists further their genealogical education. For more information, visit the Blog Book Tour Page at The Family Curator website <http://www.thefamilycurator.com/book-tour/>. I've discovered MEGA. MEGA is a new free cloud storage service based in New Zealand. I signed up yesterday and today I am happily uploading files into my 50 gigabytes of storage space. Yep, you heard me right. 50 GB. Free. 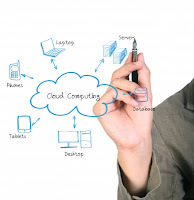 From the MEGA website "We are a dedicated group of technologists who were given the time, opportunity and Internet access to build an awesome cloud storage service that will help protect your privacy. We have programmed this Internet service from scratch in Auckland, New Zealand. Unlike most of our competitors, we use a state of the art browser based encryption technology where you, not us, control the keys." This is very interesting because that is exactly what MEGA does. You register and create an Encryption Key. That's kind of like a password. The difference with an Encryption Key is that NO one but YOU knows what it is. MEGA doesn't know. Their programmers and staff don't know. That's the good part because it means there is no way for hackers or anyone else to see your stuff. The caveat is that if you lose your Encryption Key you have lost all your files too. Because no one but you can get them ---- as long as you have your key. 50 GB of free cloud storage is pretty awesome but there's even more. A Pro Membership will buy you up to 4TB of storage. Yep for $29.99 a month you can have 4 TB of storage. $19.99 gets you 2TB and $9.99 provides you with 500GB. One tip - take their advice and log in with Chrome. I ignored the popup explaining that Chrome would give me a better experience and logged in with Firefox. I couldn't get my files to upload so I switched to Chrome and they uploaded very quickly. I was worried because living where I do with limited access to high speed Internet, I have what is commonly referred to as "last resort Internet service" (a 4G Satellite service) . I wasn't sure if the speeds would be high enough to allow me access to MEGA. But so far so good. You may find it a bit sluggish since it seems everyone is jumping to sign up. If you do just be patient and wait a few days for the initial rush to die down. I'm pretty happy about having yet another spot to store my genealogy files but I'll still be uploading directly from my iPhone to Dropbox since MEGA doesn't (yet) have that capability. The genealogy community and my Olive Tree Genealogy blog readers rock! With their help I now have a correct copy of Maggie McGinnis' Michigan marriage certificate and legible copy of her California death certificate. I've written a letter of complaint to Michigan Vital Records and will update readers on their response (if any). For those who haven't been following the saga, here are the blog posts. Be sure to read the comments! And Now a California Death Record Disappointment! Briefly, the family I'm seeking consists of Bernard (Barney) McGinnis born 1852 in Ontario Canada and died 27 October 1902 in Denver Colorado. Barney married his cousin Margaret (Maggie) McGinnis. She was born in 1844 in Ontario Canada and died 8 April 1945 in Los Angeles California. Thanks to the kindness of a reader, I now have the obituary for Maggie which was published in the Los Angeles Times in April 1945. As a bonus my kind reader (who has access to ProQuest) also found the obit of Maggie and Barney's son Vincent Joseph McGinnis who died in 1949 in Los Angeles. Barney and Maggie married in Lapeer Michigan 17 December 1876. They are living in Galt Ontario in 1881, 1891, 1901. That is the last record of Barney until an obituary placed in a Guelph Ontario newspaper. I would like to find another obit in a Colorado paper. Maggie is in Galt in 1911 and then found on a Border Crossing record dated 1916 where it states she was as in USA 1873-1877 in North Branch, Michigan and 1902-1906 in Pontiac Michigan and Denver Colorado. She is in Los Angeles in 1930 and 1940 but I have no census record of her from 1911 until 1930. * Mary Ellen (Helen) McGinnis born 1893 in Galt Ontario married Stanley Reuter in Waterloo Ontario in 1913. Last record of Mary Ellen is a Border Crossing for April 1916 when she and her son Allen are going to her husband in Michigan. 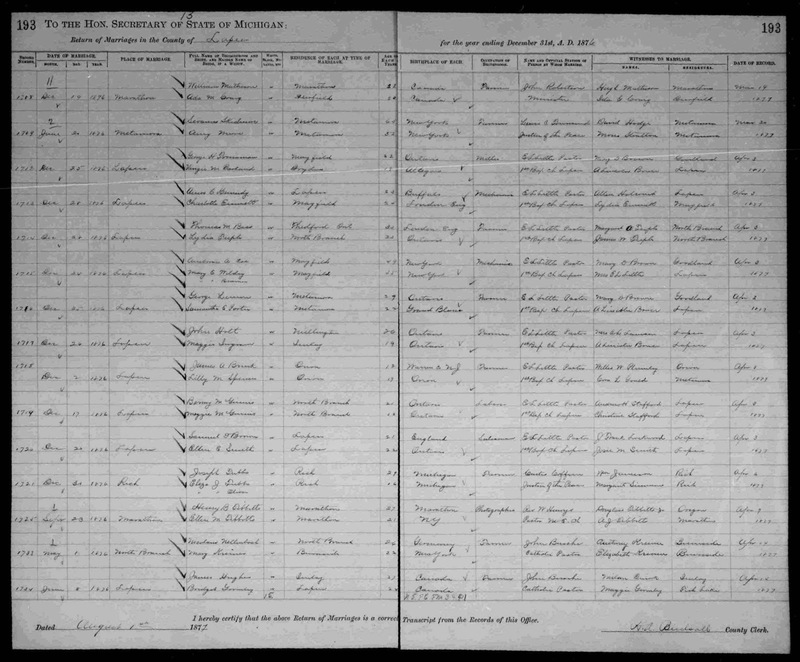 It's been a process of discovery for me - finding out that I need to do more research to learn when Death Records were kept (and where) in different states, that I need to be more methodical in my search for ancestors on FamilySearch, and that writing up my findings as a blog post helps me to see the holes in my research AND reminds me of facts I've found but forgotten about! I welcome any ideas or suggestions from my readers for my next steps in searching this family. community through the efforts of many dedicated volunteers?  Thousands of soldiers mobilized in Schenectady during the French and Indian War? District during the summer of 2012? moving from Schenectady to settle near Fort Hunter?  Hurricane Irene’s destructive force actually accomplished something positive? Archaeology Program (CAP) at Schenectady County Community College. historical print on canvas by Len Tantillo. Schenectady families settled there in the 1700s. learning! We are looking forward to your support and sharing this exciting event with you! Recently I talked about DNA and Native American Heritage. I'm a recognized Metis in Canada. I have my official Metis card. But I hoped for confirmation of my Native American heritage through DNA testing. Through the kindness of a stranger on an online forum I learned that a Professor with the University of Chicago does in-depth DNA analysis of individuals' raw data to determine your ethnic origins. Well I'm very pleased to say that the Professor's computerized analysis of my brother's Family Tree DNA raw data gave the answer I'd hoped for - he has .7% Native American heritage. Along with his analysis, Professor MacDonald sent a computer generated map, a bar graph, a scatter graph and a 5 page explanation of how to read and understand the generated pages. I also ordered an upgrade to my brother's Y-DNA test on Family Tree DNA for D9S919 which was suggested by Roberta Estes in her blog post Proving Native American Ancestry Using DNA . I've had my brother's Y-DNA tested (also Family Finder for him) at Family Tree DNA. What test or upgrade do I order to test for Native American heritage? 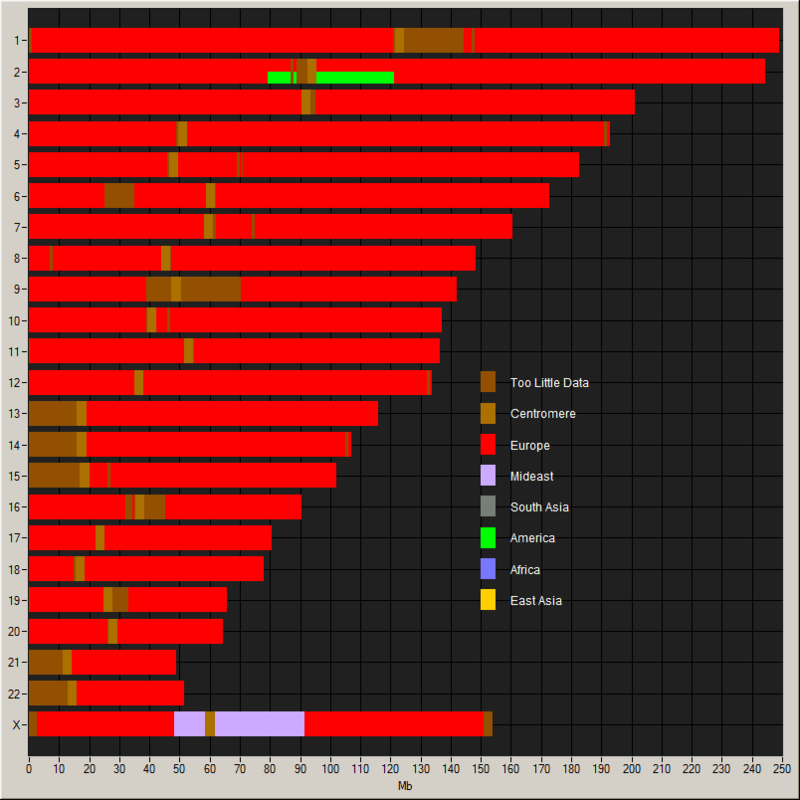 "Any of our tests can potentially reveal Native American ancestry. The test results will show, depending on the type of test you choose, whether or not the line you are testing is Native American in origin or if you have a detectable percentage of Native American ancestry (>3%)." Interesting enough, Family Tree DNA help desk did not suggest I order the test for Marker D9S919 which is available on their site. I'm not sure why this wasn't suggested, but I'm not an expert and can only go by what Roberta and other online websites indicate. "D9S919 is a STR marker located on chromosome 9. It was previously known as D9S1120 and under this name it was reported that an allele value of 9 was only found in the Americas and far eastern Asia. The presence of an allele value of 9 is therefore a strong indication of native american ancestry somewhere within a person's pedigree. This marker is available from Family Tree DNA." Indeed it is. For a small fee of $15.00 I was able to order the test of this specific marker on the Family Tree DNA website. The Family Tree DNA help desk explained that only the Family Finder test will give a breakdown of ethnic percentages found within the individual's overall genetic makeup, including Native American. 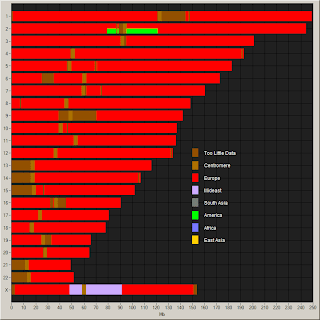 Using the Family Finder test, it does not matter which line the Native American ancestry came from or whether or not that ancestor was male or female. I had previously ordered Family Finder but it did not show our Native heritage - which was no surprise because Family Tree DNA pointed out that you must have 3% or more for the test to show your Native American heritage. Help Desk provided a welcome explanation of the three tests that could determine Native American heritage but I am curious why they didn't advise me to order the $15.00 test for the D9S919 marker. My conclusion is that the onus is on the individual to explore and read everything he or she can find that might give the answers being sought. Or in other words, don't give up even if you hit a dead end! Keep looking for alternate answers. It's just like doing genealogy research. "I hate to be the bearer of bad news, but the information that's on the certificate is not even correct. First off, the "file date" is wrong, it's actually April 3, 1877. The Aug 1 date is the date that the clerk recorded the state copy for the year 1876. This is a minor mistake. This second mistake is not so minor. The witnesses were actually Andrew H and Christine Stafford, both of Lapeer (they gave you the one for the marriage below Barney and Maggie). And there is a church listed for the pastor, which is correct (E. L. Little), I think it says "1st Bap Ch Lapeer." It also notes the Barney was a laborer. 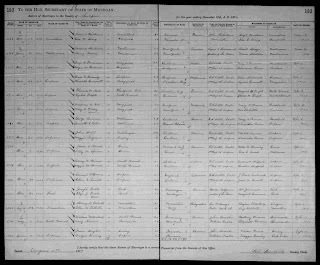 The record can be found here (https://familysearch.org/pal:/MM9.3.1/TH-267-12390-89997-9?cc=1452395&wc=990450) line 1719. It's part of the Michigan, Marriages, 1868-1925 database"
Julie goes on to add "That's a lot of money for a piece of paper that doesn't have the correct information and is missing possible clues, such as the church"
I agree! So today I checked the online image (thank you Julie!!) and saw that all the errors Julie found are indeed there, and I found yet another. The age of the bride (Maggie McGinnis) is incorrect on the transcript. The image clearly shows her age as 18 but my official transcript has hear age as 16. I can see that whoever transcribed the document wrote down the names of the witnesses of the marriage UNDER my Barney and Maggie. They skipped the correct witness names which Julie found. "I hereby certify that this is a TRUE AND CORRECT representation of the vital record facts on file..." The upper case letters are mine for emphasis. So the bottom line is that I paid over $70.00 for a document CERTIFIED to be "TRUE AND CORRECT" and it is full of erros. My question is what is my recourse? Do you think it will do me any good to file a complaint? And where and to whom do I complain? The fact that the image was online is entirely my oversight; that is not my complaint. But should not the "verified" transcript have the correct information copied from the image on file? About 30 minutes after I published my blog post yesterday called Disappointment of a Michigan Marriage Record, the California Death record I ordered through VitalChek arrived. That's it on the left. The good news is that the names of Maggie McGinnis' parents are given! So I know now which McGinnis couple were her mother and father - Daniel & Margaret or my ancestors Joseph and Fanny. The bad news? The huge label printed across the death certificate effectively hides many of the facts! For example I cannot make out the name of the cemetery where Maggie is buried. The address of the informant (her son) is hidden. And if I didn't already know the exact location of her birth and if I was not familiar with Ontario towns and villages, I doubt I'd be able to figure it out from the record. Much of the name (Plattsville) is obscured. Since this death record cost me $48.50 I'd have expected to be able to see it. All of it. A kinder way to handle this would for the originating record office to use a hand stamp that a clerk could place partially on the record (where there is no writing) and partially on the white border. But the bottom line is that $120.00 later (for the Michigan and the California records) I have what I wanted - the names of Maggie's parents. It's been an adventure and an experience getting there! Recently I ordered an 1876 Marriage Certificate from Michigan through VitalChek. I desperately wanted the name of parents of the bride (Maggie McGinnis) and FamilySearch does not have the image online. Maggie is part of my McGinnis family in early Ontario but I cannot determine if she is the Margaret baptised at Church of Our Lady in Guelph on January 17, 1857 to parents Daniel McGinnis and Margaret Downey *or* if she is the Margaret baptised at Church of Our Lady in Guelph on December 6, 1856 to parents Joseph McGinnis and Fanny Downey. She married Barney McGinnis who was the son of Daniel's brother Hugh McGinnis. I lose track of both girls after 1871 census so have not been able to eliminate either as the Margaret who married Barney. The marriage certificate might have the information I need. On the plus side, the certificate arrived very quickly at my door. On the disappointed side, neither bride nor groom's parents' names were recorded. And on the negative side - the cost! The total cost was $70.25 U.S.
Have you picked yourself up from the floor yet? Let me give you the breakdown. So why was a Michigan certificate $20.00 more than a California one? I don't have the answers to this difference by state and in the end it's no use complaining. I wanted the certificate and I paid for it. End of story. Let's hope that Maggie's death record has her parents' names! Otherwise I've just spent almost $120.00 for two certificates I didn't need. To say I'd be disappointed is putting it mildly. But that's the price we often pay in this wonderful hobby called genealogy. It's the How to Archive Family Keepsakes Blog Book Tour and Olive Tree Genealogy is the stop today. My readers know how passionate I am about preserving family treasures. Well today you are in for a treat! Denise Levenick is the guest author today. So read on for great tips on deciding what items are worth archiving. As an added bonus you can get a FREE PDF Chart Handout What To Do With What You Inherit: Save, Skim, or Toss, (Read on for information about downloading the free handout). It can be hard for family historians to let go of anything that might carry a family story, no matter how old or broken that keepsake might be -- the chipped china teacup you remember from your grandmother's kitchen cupboard, the mildewed children's book that was once bright and new, the keys to long-forgotten locks. One key isn't much to save, but it doesn't take long for family keepsakes to become a mountain of memorabilia that threatens to come down on our present life like an avalanche. So, how do we choose, what to save, what to toss, and what to give away? I've sifted, sorted, and organized dozens of family collections, and discovered that it sometimes "less" is truly "more," even when it comes to family archives. Yes, we could probably find a family story in every single item set aside and saved, but is that the story we want to preserve? Or, knowing the story, can we let the item go? Our ancestors were mobile people, and as anyone knows who has ever moved from home to home, each relocation typically involves a kind of triage. Some things are tossed away, others carefully packed up and moved to the new home. Rarely is a home moved intact from place to place. The same kinds of decisions occur between generations. Sometimes, a son or daughter will inherit an entire home of possessions and need to begin the difficult task of sifting, sorting, saving, and tossing. Family historians will want to be on the lookout for anything that documents vital record information (birth, marriage, death records), hints at unknown family members, or fills in the blanks for "mystery years" or "family secrets." 1. Why did my ancestor save this? The answer could be quite simple. Maybe your mom, like her girlfriends, followed the current fad and pressed her prom corsage in her school yearbook. Or, perhaps your grandmother added a caption to a baby photo because there was no other documentation of birth. The dried flowers are sentimental, but can be discarded. The baby photo, however, should be preserved with its important handwritten note. 2. Is it unique, one-of-a-kind? Some family letters, photos or documents might be the only proof of birth or other event; you will want to save those items that document a vital event or important family story. You might be unsure whether or not an item is worth keeping. When in doubt, save it, especially any original document decades old with names, places, and dates. You may discover connections later in your research. Think again about Question #1: Why did my ancestor save this? “Value is relative,” you may have heard it said. And, it’s true. What’s valuable to you today, may not be valuable to your children or grandchildren. Some items, like books and newspapers are now available in digital versions. Save digital copies as PDF images and let go of the paper copies. Or save a digital copy and file a single paper copy as a backup. Digital storage is less expensive than physical storage space. Do preserve your family’s heirloom original documents, though. They may be priceless and unique. Four "Yes" answers should be a clue that the item is worth preserving, or at least holding for further consideration. I've found 19th century baby photos tucked between pizza take-out menus and trade union cards stashed in old wallets. You have to look inside everything, but then, it's ok to toss the cracked plastic envelope, the take-out menus and the smashed, blackened prom corsage. Take a digital photo if you need a visual reminder of the artifact. Write a short note if it holds a special story. If in doubt whether or not you should let something go, ask yourself if you've ever saved a similar memento from your own life experience, and what you expect your children to do with it. Sometimes, it's ok to give yourself permission to hold on to the memory and let go of the clutter. For a FREE PDF chart What To Do With What You Inherit: Save, Skim, or Toss, visit www.thefamilycurator.com/saveskimtoss. Join the Blog Book Tour for How to Archive Family Keepsakes January 10-26, 2013 for author interviews, book excerpts, giveaways, and more. Visit the Blog Book Tour Page at The Family Curator website for the complete schedule . What is Hot and What is Not in Genealogy?